If you've been reading Postal to this point (as you very well should be) you know that Mark's mother is a heartless abusive monster of a person. As frigid and unsympathetic a figure you'll find in popular fiction. Yet, she remains worth having on your side when things go bad. And after the events in issue three, things went really bad for Mark and you need a cunning and emotionless avenger in your corner...when she gets around to it of course. Matt Hawkins and Bryan Hill have put Mark through the ringer in four issues and in Postal #4 they let him seek some revenge when no one else seemingly will listen to him. It's not the kind of vengeance you'd expect. Mark just wants an apology from the guys his long-thought-to-be dead dad had hired to torture him. Mark deserves some justice from a world that has continually ridiculed him and made him feel different for having Asperger's. It won't be easy to get that apology without some coaxing. Meanwhile, Maggie is getting her stuff together. Inspired by Mark, she tries to take control of her life and stop sacrificing her future because of her circumstances. She's been Mark's sole friend and in a town of dubious residents hiding from their past, taking a stand in order to eek out an existence beyond Eden is a bold move. A move that may cost Maggie if she's not careful. Hawkins and Hill have created some interesting characters and developed them from the beginning. There's only a handful of them in the series, but Mark and Maggie carry so much weight that what they do resonates from one issue to the next. Yes, there are some twisted moments but the story pivots on those two well-crafted characters that make the book so engrossing. 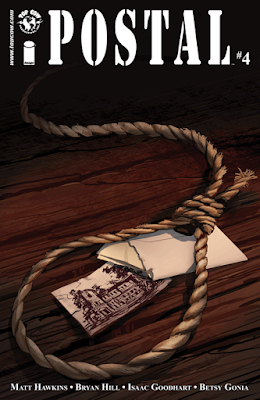 Isaac Goodhart's pencils and Betsy Gonia's colors give the book its polished and clean look. Goodhart has actually gotten better as the series has continued. The characters are more expressive and the layouts more fluid. Gonia keeps to a limited palette that gives the series a signature appearance that is appropriately dark and eerie. 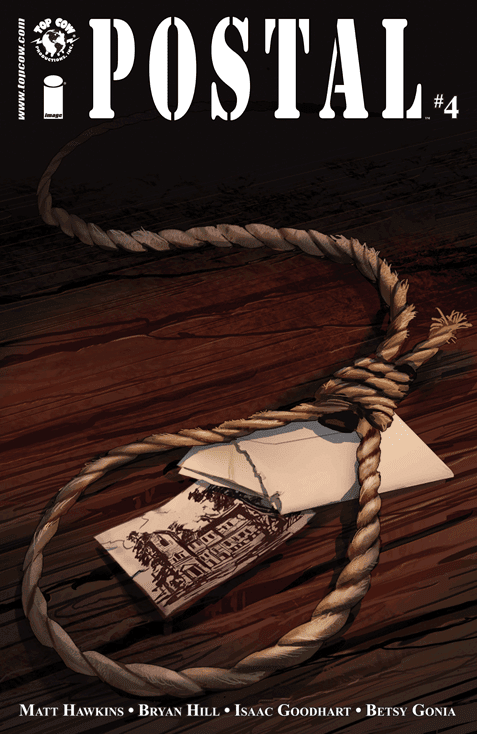 Postal continues to be a gripping read that doesn't rely on action for action's sake. Admittedly, they will have to get to the larger villain they introduced soon. Mark's mom can't be the heavy and the savior despite her selfish motivations. Still, Mark continues to be one of the best lead characters in comics even as heart-breaking as it can be to see him in the middle of such evil and depravity. And the darkness is just beginning.